So normally, whether I’m travelling for vacation or for work, I fly coach. If I am buying my own ticket, I would rather spend more at my destination than pay more to get there. Plus, I’m short, so the lack of leg room doesn’t bother me, unless it’s really extreme. But on one of my recent long-haul trips for work, I was offered to fly business class, as I would be travelling more than 14 hours and would not be able to take a 24 hour rest before having to start working. Since my first meeting was first thing in the morning the day after I arrived, I took them up on the offer! So please forgive me if I sound wide-eyed and naive in this post, but I’m just not accustomed to such luxury! I have had the occasional upgrade for shorter trips, but never such luxury on a long-haul, where it’s #1 – more meaningful, and #2 – much more fancy on the larger jets that take you on those longer flights. 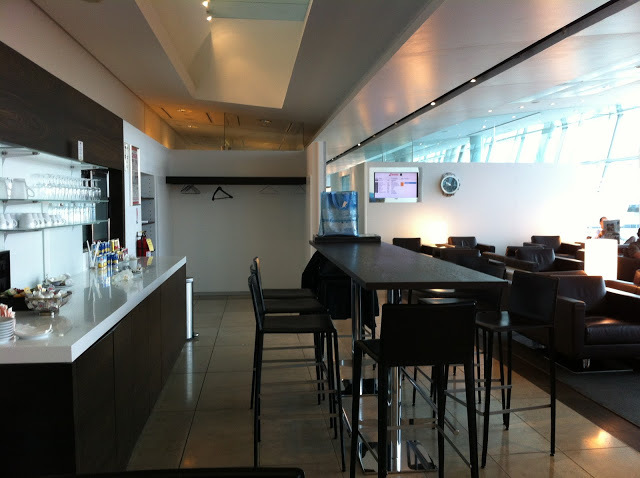 I headed to the lounge, and settled in. They had a good breakfast spread laid out, so I plugged my laptop into a tall table to do some work while I ate some breakfast. Something hot – some eggs or something – would have been nicer, but even just a bagel with cream cheese was fine by me! Add some orange juice, some coffee, tea or hot chocolate, or even booze (which I wasn’t quite ready for yet! Too early!) and I was a happy customer. The time came for my flight, and I have to say, even just turning left when I got onto the plane instead of turning right was already a thrill! Then I found my seat and was excited to find that my seat would fully recline and give me many much more comfortable options than the seats I am used to in coach. It offered options like “cradle”, “bed”, “upright” or any combination thereof that you can come up with! And extra bonus? A massage feature!! It’s like flying in a Sharper Image recliner! And my favorite part? Even if I had my chair fully extended out, my seat mate did not need to disturb me to get around me to the aisle to go to the lavatory!! It’s the little things, but the fact that he could move around me and didn’t have to wake me when he needed to get up was fantastic!! 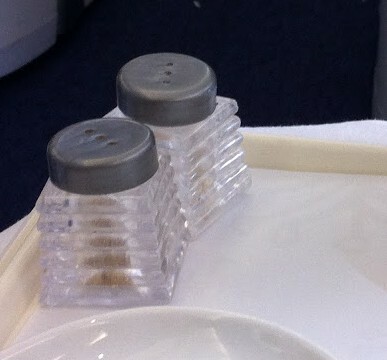 Once I was settled in, the flight attendant came through offering a beverage before take-off. A glass of Moet & Chandon? Why thank you, I don’t mind if I do! I mean, I’m not the one flying the plane, so why not! Moet & Chandon is a favorite champagne of mine, so I really didn’t mind sipping on a glass or two!! 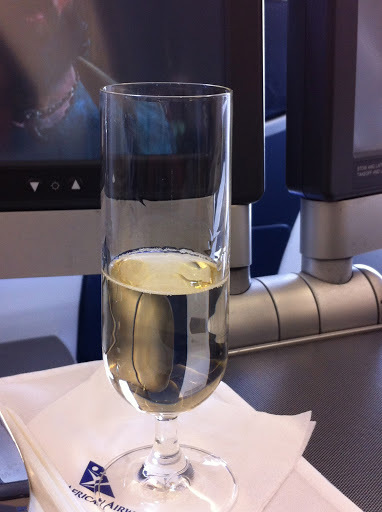 Actually, as luck would have it, it seems no one else in Business Class was indulging…. the flight attendant came back and told me that I should keep drinking, because the bottle was already open anyway, so basically, I had my own personal bottle, and it was a long flight! She just kept on coming back and refilling my drink! But with the knowledge that I had work to do shortly after I would arrive, and the altitude & cabin pressure making the bubbly go to my head even faster, I made sure not to go overboard, so that I could still do some reading and prep for the work week ahead. 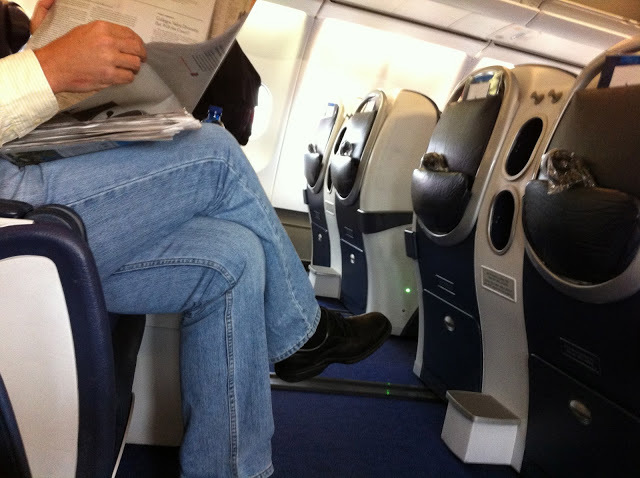 Plenty of leg room, even for the tall guy next to me! Now back to one of the essential features of business class: the seat! As I said, I’m what you would call “vertically challenged” (read: short), but even I find that some economy sections on some planes are too tight. Here, that was DEFINITELY not a problem!! Even the tall guy next to me had plenty of leg room to spare!! The seat itself was one of those fully reclining deals, which was kind of awesome! It had a mattress pad and duvet for when sleepy-time came around, and the pillow was actually a nice pillow…what a concept! One feature of the seat that I loved was the individual, subtly hidden, electrical outlet, so I could keep my MacBook fully charged. Bonus!! There were cubby-holes for all your stuff, which is nice because I like my flying amenities (ear phones, iPod, Kindle, lip balm, my favorite hand cream, contact lens case, etc.) close at hand. And speaking of amenities, they gave a nice little travel pack packed full of goodies, like a mini-toothbrush & toothpaste, socks, ear plugs, eye shade, a pen – all in a nice little hanging travel case. You know, the kind of stuff they used to give out even in coach 15-20 years ago! A nice touch. Then there’s the entertainment. Of course, each seat has its own entertainment system. Easy to use, even though I found that I must have been hitting something over and over because the movie kept resetting itself – I probably could’ve figured out how to get back to where I was if I tried hard enough, but honestly, it was just easier to just let it replay so I could either concentrate on work or doze off to sleep until I got back to where I had last left off. I watched a few TV shows, and then the movie ‘Friends With Kids’ – which was not bad. Not something I would have sought out in the theaters but certainly enjoyable to pass some time on a flight!! 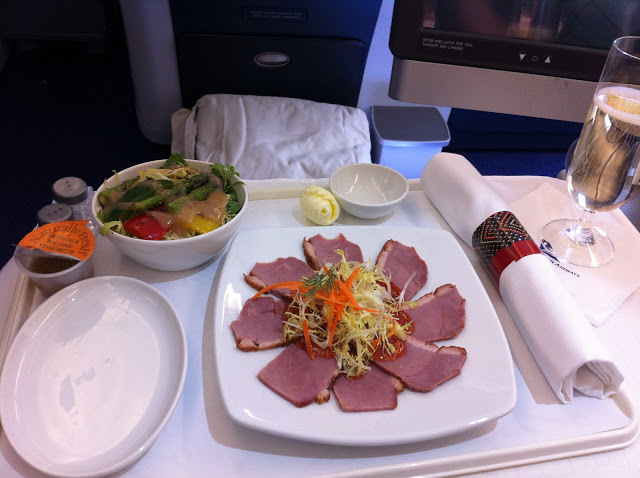 Another feature of Business Class that is infinitely better than coach: The meals!! Now, I’ll only tell you about one of them, because I felt like way too much of a nerd taking pictures of all of my dishes even just through one meal, so I stopped taking pictures after the dinner. But that dinner was pretty impressive! We started with a cute little canapé appetizer, followed by a first course – I chose Smoked Duck with grilled asparagus salad. Nice presentation, on real china and using real silverware! Oh yeah, with cloth napkins and a little individual “table-cloth” for my tray area. Nice extra touch there!!! I was suitably impressed. For my main course, I opted for the Roasted Chicken with truffle walnut sauce & grilled Brussels sprouts. 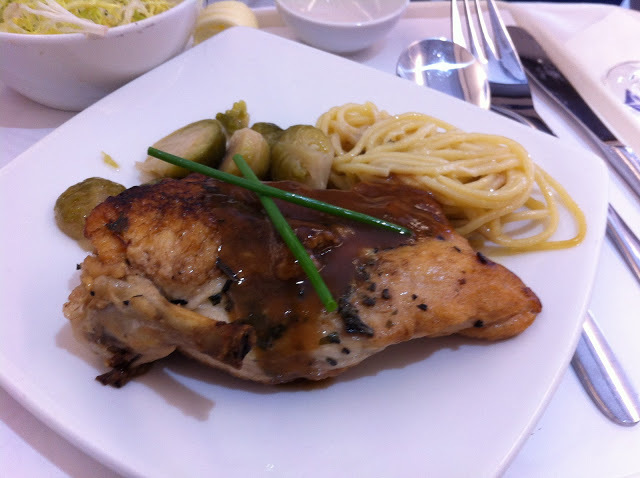 First of all, the chicken was not the usual airplane pressed-chicken, rubbery filet. It was a beautiful, juicy, perfectly cooked piece of chicken, well seasoned and nicely presented. Secondly, I love brussels sprouts. I know that makes me in the solid minority of vegetable eaters, but what can I say, I love them. But I thought that their selection for the menu was bold, given that there is such strong dislike of them in many people, and airplane food usually tries its best not to offend with, you know, flavor of any kind. I applauded the bold choice. 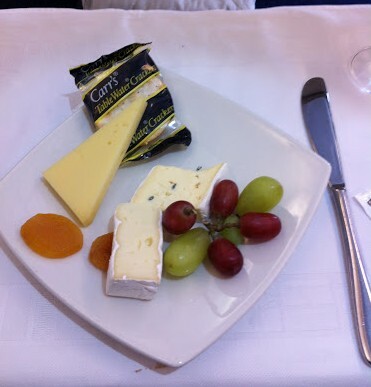 And finally, in all my many years of flying in economy class, I have never had – or even been offered – a truffled anything dish!! And I firmly believe that truffle makes everything better, so I was thrilled with the truffle walnut sauce. Yummy!! Airplane dessert is another thing that I have never in all my years of travel found particularly enjoyable, so I was happy to see that the menu offered a lovely cheese plate as an alternative to dessert, and I opted for that. Carr’s water crackers – my favorite. A couple of grapes. A bit of dried fruit. And a nice selection of cheeses. Perfection. Well, that really about sums up the highlights of my flight. The flight attendants were around if you needed them, and provided good service, without being over-bearing or bothersome. Friendly & professional. No complaints there. Overall, it was an excellent flying experience. And I’d highly recommend it for longer trips to anyone with money to burn, or with a generous employer who will pick up the tab!! For shorter trips, I don’t really find it necessary myself (though I’ll never refuse it if they want to upgrade me!!) – at least not necessary enough that I’m willing to foot the bill for it! But I will definitely consider upgrading for my next flight that’s over 10 hours!! For a trip like that, it is well worth it!! Especially if you can do it with your air miles program!! As always, solid reporting! 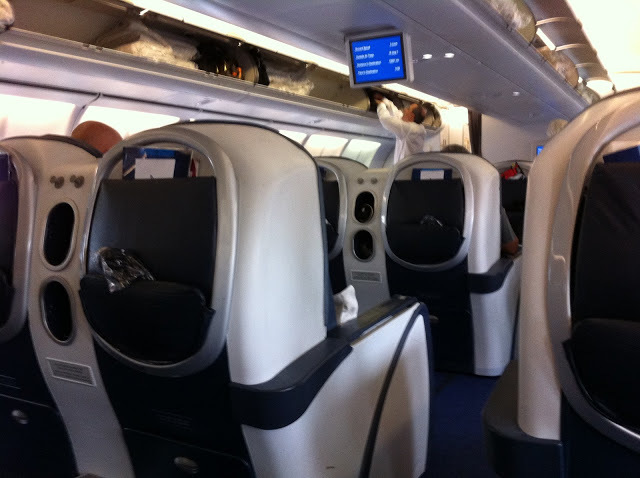 I am a huge fan of first and business class travel. Thanks!! I don’t think I should grow accustomed to the fancy life – I suspect my life will remain in coach for the foreseeable future! 😉 C’est la vie! As long as I get to keep travelling, no matter what class, I’ll remain a happy Chitalian!